With fewer smoggy days and more blue skies, the winter of 2017 in Beijing and the neighboring areas of Tianjin and Hebei Province was regarded as a moment heralding the initial success of the battle against air pollution in China. Yet the government isn't prepared to rest on its laurels as evidenced by its most recent action plan which encompasses a bigger vision. Official figures from the meteorological authorities show that in 2017, only 21 heavy pollution days were recorded in Beijing and its vicinity, a much lower figure compared with 58 in 2013. That was the peak year for pollution when the Central Government introduced its Action Plan on Air Pollution Control and Prevention. Since then, pollution has seen a steady decline. Monitoring stations across China recorded 27.5 smoggy days on average in 2017, 19.4 fewer than in 2013. This figure is expected to fall further in the coming years. 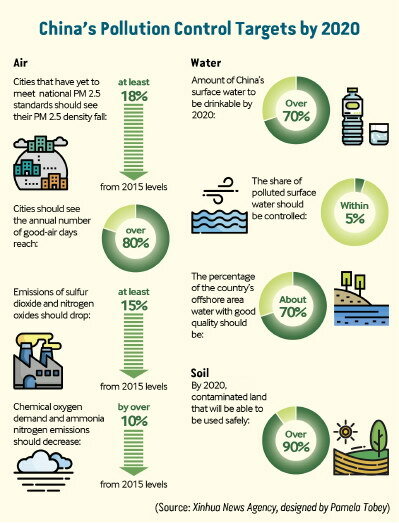 On June 24, the Central Committee of the Communist Party of China and the State Council, China's cabinet, unveiled a guideline on the specific pollution prevention and control targets the country expects to achieve by 2020 and beyond. The fight against air pollution, as the guideline stated, will still focus on regions like Beijing-Tianjin-Hebei and surrounding areas, as well as the Yangtze River Delta. Shanxi and Shaanxi provinces—the main coal-producing regions in the country—will also be targeted. Pollution levels from 2015 will be the reference indicator. By 2020, cities at the prefecture level and above should see the number of good-air days reach over 80 percent annually, according to the guideline. Emissions of sulfur dioxide and nitrogen oxides should drop at least 15 percent from 2015 levels, while chemical oxygen demand and ammonia nitrogen emissions should decrease by over 10 percent. On June 11, the Ministry of Ecology and Environment (MEE) dispatched 200 inspection teams to Beijing, Tianjin and Hebei to review the state of air pollution prevention and control. The 200 inspection teams spotted a total of 2,690 cases involving air pollution control law violations, including 355 failed attempts by local authorities to shut down or upgrade high-emission enterprises, and 660 cases of enterprises discharging industrial dust into the air without proper treatment. Other problems included factories failing to install or operate pollution-control facilities and construction sites or open mine pits failing to take proper measures to reduce emissions. The teams also found that some local governments even took measures to help enterprises conceal pollution for the sake of economic growth. Still other enterprises failed to rectify problems as instructed. "Supervision teams will be dispatched to every county in the covered provinces and municipalities," said Tian Weiyong, an MEE official in charge of environmental supervision. "By winter, about 1,000 inspectors will be working in all 80 cities in these areas to fight air pollution." On May 30, a court in Jinzhong, north China's Shanxi Province, sentenced five people to six months to two years in prison for tampering with air quality-monitoring equipment and falsifying data. Zhang Wenqing, former head of Linfen's Environmental Protection Bureau, is one of the five. In early 2017, Linfen was in the spotlight due to its frequent alarmingly high concentrations of sulfur dioxide. In response, Zhang ordered an official to find ways to "beautify" air quality data in the city. The perpetrators then tampered with the monitoring systems at six of the city's stations. The abnormally good air quality data finally caught the attention of the China National Environmental Monitoring Center and it notified the MEE, which then sent an inspection team to Linfen. A police investigation later found that air quality monitors had been tampered with more than 100 times over a one-year period beginning in April 2017. "The case of Linfen is rare but not the only one," Tian said at a press conference on June 29. "The motivation to falsify monitoring data is rooted in economic interests. Instead of taking effective measures to improve the environment, Zhang hired perpetrators to produce fake data. It shows that some local governments still place more importance on economic growth and political achievements than environmental protection." In June 2017, a court in Xi'an, Shaanxi Province, sentenced seven people, including the heads of two environmental protection bureaus in local districts, to jail terms of over one year for falsifying air quality-monitoring data. They were found guilty of interfering with the data collection of the air quality monitoring system by plugging the sampling instrument with cotton to lower the pollution index. Falsifying environmental data to evade pollution regulations has been punishable as a criminal offense since January 2017 under judicial interpretations on environmental crimes formulated by the Supreme People's Court and the Supreme People's Procuratorate, the nation's top court and prosecuting office. Previously, offenders would usually receive lenient administrative penalties. President Xi Jinping called for the strictest measures in protecting the environment during a tone-setting meeting on environmental protection held in Beijing in May. "Institutional innovations must be accelerated and the enforcement of laws and regulations must be strengthened," Xi said. Last year, Chinese courts concluded 20,602 criminal cases related to pollution as well as 190,125 civil disputes and 30,866 administrative lawsuits involving environmental protection, according to the Supreme People's Court. The battle for blue skies first appeared in Premier Li Keqiang's Government Work Report in March 2017 and has since accelerated. Beginning in January 2019, the country will supply gasoline of a higher emission standard to vehicles. Environmental protection industries will be boosted to promote energy conservation technologies and products, while substandard coal-fired power generators and boilers will be eliminated. 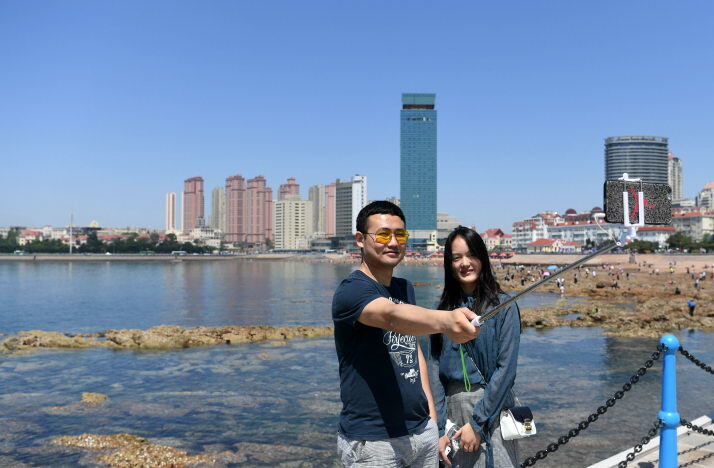 According to Tian, the official from the MEE, since May 2017, all chimneys over 45 meters tall in Beijing, Tianjin and 26 cities in Hebei have been equipped with a real-time monitoring system to check emission levels. Prevention and control of water and soil pollution are the other two major areas covered by the guideline. China released the Action Plan for Water Pollution Control and Prevention and the Action Plan for Soil Pollution Control and Prevention in 2015 and 2016, respectively. In the new guideline, the goals for these two areas are more detailed. For water quality improvement, the country will continue to implement the action plan on fighting water pollution as well as the system of "river and lake chiefs." River and lake chiefs are officials responsible for the management and protection of water resources who will be held accountable if environmental damage occurs in bodies of water under their supervision. There are now approximately 320,000 river chiefs at various administrative levels nationwide. 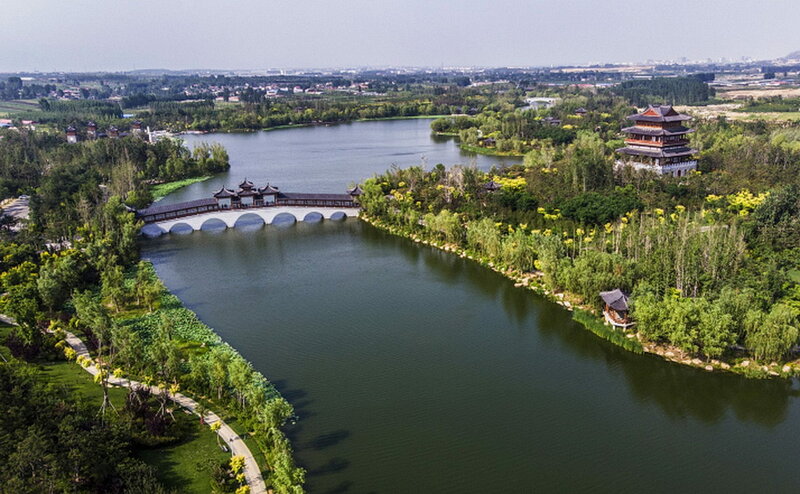 By 2020, over 70 percent of the surface water in China will be drinkable and the share of polluted surface water should be controlled within 5 percent. Meanwhile, about 70 percent of the country's offshore area water should be of good quality. The country will stage a campaign to address salient problems damaging or polluting its rivers and lakes in the second half of the year. The campaign involves tackling solid waste disposal along the Yangtze, China's longest river. Restoration of the river's ecosystems is high on the agenda for the development of the Yangtze River Economic Belt. The MEE has sent teams to regions along the belt to inspect the illegal discharge of solid waste. The official website of the Ministry of Water Resources says that a thorough inspection and rectification program will be completed before the end of the year. The dumping of waste in reservoirs and illegal sand mining is also targeted. To address soil pollution, China will take specific measures to restore polluted soil, promote waste classification and enhance prevention and control of solid waste pollution. By 2020, over 90 percent of the contaminated land should be used safely, according to the guideline. Rural areas also feature in more detail in the new anti-pollution campaign. On July 3, a contamination control standard for agricultural and development land was released on the website of the MEE as part of the national campaign against pollution. Depending on the content of pollutants, such as heavy metals or hazardous chemicals, the standard sets risk screening and intervention values for soil contamination. According to the guideline, agricultural land that exceeds risk intervention values will either be prohibited from harvesting edible agricultural products or given over to forestry. Development land that exceeds risk intervention values will be put under remediation, the MEE said. "Although progress has been made, the improvement of the living environment in rural China is unbalanced, with many areas in the grip of dirt and disorder," a document jointly released by the ministries of housing and urban-rural development, ecology and environment, water resources, and agriculture and rural affairs in early June stated. "It falls far short of people's expectations and marks a key weakness in social and economic development." "The government has long paid more attention to environmental protection in urban areas, resulting in a grim situation for rural environmental protection," said Ma Yong, Deputy Secretary General of the China Biodiversity Conservation and Green Development Foundation. Such a situation could lead to soil and underground water contamination in rural areas, Ma added. Mao Da, a policy consultant at the China Zero Waste Alliance, an NGO, said that life in rural areas has become more urbanized, which has led to an increase in locally generated waste. How to deal with such waste requires more targeted measures, instead of merely duplicating the urban mode of waste disposal.